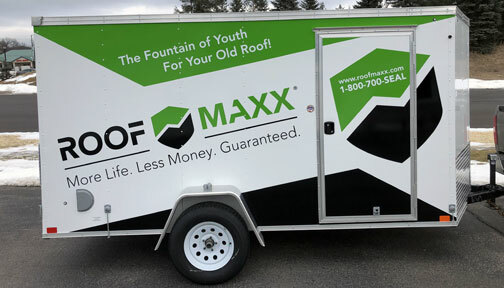 A local dealer came to us with a supplied Roof Maxx trailer lettering design from the franchise and wanted a price to wrap his trailer. After reviewing the design and more importantly, pictures of his trailer, we decided to send two different price options. 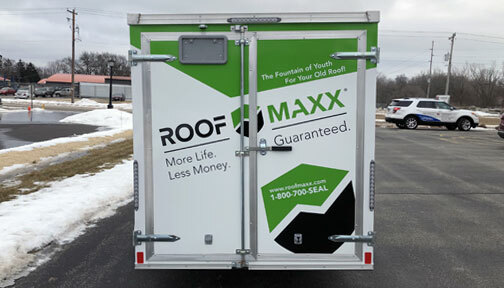 The first option was to completely cover the sides and rear of his trailer with a digitally printed wrap. The second option was to letter the trailer using conventional plotter cut vinyl graphics. Both options would have been acceptable for this application, however, one stood above the other. The wrap option carried a hefty price tag and the plotter cut vinyl graphics were HALF the cost of a wrap but accomplished the same results. Can you guess which option our client chose? You see, the trailer our client had was already white. Therefore, there was no need to cover the white trailer with unprinted white wrap material. In addition, the design featured solid colors. There were no shadows, gradients, highlights or photographs which are elements a digitally printed wrap could only produce. You guessed it, conventional plotter cut vinyl graphics was the choice! Don’t get us a wrong, wrapping a vehicle has its place and time. However, sometimes the high cost of printing, laminating and applying multiple sheets of wrap material does not make financial sense. To sum up, we were not only able to achieve the same look as a fully digital printed wrap but the best part was the fact we saved our client a lot of money! Contact Us today to see how much we can save you on your next Vehicle Lettering project! 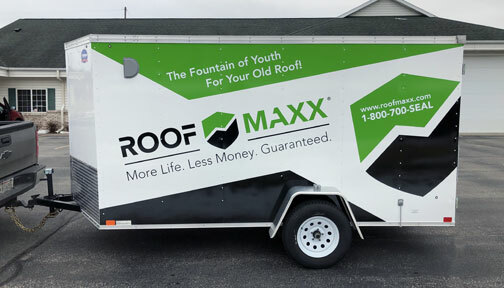 Interested in knowing more about the Roof Maxx system? Contact Steve at Clear Choice Energy Solutions.